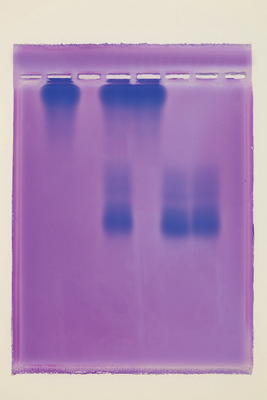 Identify a protein defect using agarose electrophoresis. In an attempt to determine the presence of the sickle-cell anemia trait, students will use agarose electrophoresis to separate several simulated hemoglobin protein samples. They will learn to identify and differentiate between normal hemoglobin and sickle-cell hemoglobin. They will also learn to identify those who are heterozygous for the sickle-cell gene. Accessories information: An agarose electrophoresis chamber, power supply, and 10 μL micropipets, required, are available separately. Ordering information: Eight gels are included in the kit as well as a teacher’s guide and student copy master.